Recognize dedicated service with this lovely plaque. 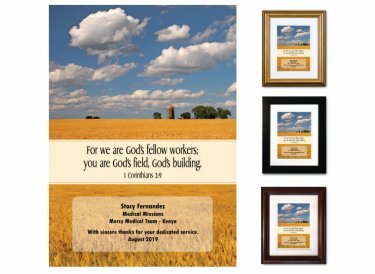 The "amber wavers of grain" design complements the excerpt from Paul's first letter to the Corinthians: For we are God's fellow workers; you are God's field, God's building. You'll personalize it with the recipient's name, job name, and the name of your church or organization along with your own special message.